A Rising Tide or a Flood? Visiting New Orleans has me thinking a lot about cross-racial solidarity among people of color. New Orleans, one of the Blackest cities in the country, is also home to one of the largest Vietnamese-American communities in the U.S. That the mainly working class Asian immigrant communities here are increasingly well organized gives me hope. But the color line in the Deep South is so brightly drawn, and the penalty for being on the down side of unjust racial power relations is so steep, that I find myself struggling to remain optimistic. My worry brings to mind that old saying, “a rising tide lifts all boats.” That saying is often used when talking about the effect of low-income groups rising, but my knowledge of the history of my family in Hawai’i makes me aware that if we’re not careful, what to some of us is a rising tide, can to others simply be a flood. Hawai’i was annexed to the U.S. in 1898 following the illegal overthrow of the Hawaiian monarchy in 1893, a coup orchestrated mainly by white American citizens. The Territory of Hawai’i was controlled by a white-dominated Republican oligarchy that consolidated power through five corporations known as the Big 5. The oligarchy maintained their power by imposing a system similar in many ways to Jim Crow in the U.S. South on Hawai’i’s labor force. This system weighed most heavily on those who worked on the sugar plantations that were the engine of the territorial economy. But in 1946, a major, industry crippling strike of sugar workers brought the plantation system to its knees. The key to the success of the strike was that it was multi-ethnic. Previous efforts to force plantation owners to the bargaining table were limited by inter-ethnic conflict encouraged by segregating workers into ethnic labor camps. The ethnic unions that arose from this camp system were too small. But when finally a class-based union was formed, workers won. That victory was a critical step toward the eventual overthrow of the Republican oligarchy. 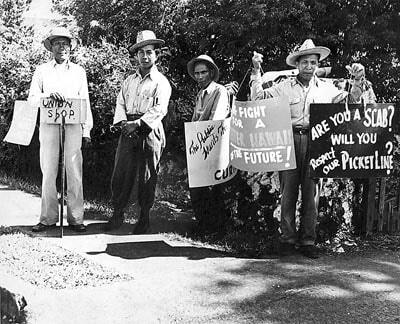 By 1954, a coordinated campaign of general strikes, civil disobedience, and non-violent protests caused a minor revolution in Hawai’i politics. In the territorial elections of 1954, the Democratic Party of Hawai’i finally overthrew the Republicans and broke the absolute control that the Big 5 had over Hawai’i workers. The Democratic Party of Hawai’i was a multi-ethnic, people of color majority party, and it has controlled the Hawai’i legislature ever since. Largely via their leadership, Hawai’i became a state in 1959. Sounds like a nice story, right? By getting on board with the union, Hawai’i’s multi-ethnic, overwhelmingly non-white working class was able to ride the rising tide of U.S. economic growth fueled in large part by the expansion of U.S. empire following WWII. And, the liberal victory in Hawai’i has proven a pretty durable one. But the organizing that lifted Hawai’i’s working class largely excluded Native Hawaiians. It never addressed the illegal overthrow of the nation of Hawai’i nor the landless and impoverished state of the Native Hawaiian people. As a result, it didn’t really break the power of American elites in Hawai’i who lost absolute power, but continue to enjoy definitive power. And when Hawai’i’ became less profitable, many took their toys and left in search of cheaper labor markets. Today, Hawai’i still suffers food insecurity as a result of land monopolization and insufficiently diversified agriculture. And tourism dominates the economy, producing mostly insecure and low wage service sector jobs. During the years of the rise of immigrant workers in Hawai’i, Native Hawaiians suffered starvation as a result of the reorganization of land ownership and from diverting water from Native Hawaiian taro farming to plantations and tourist developments. And each step forward for immigrant workers and their children was a step backwards in terms of the hope for a return to a free and independent Hawai’i. Today, independence for Hawai’i is widely considered a pipe dream, and sovereignty efforts are mainly concentrated on winning treaty rights. The demographics of Hawai’i are changing as people of color, especially Native Hawaiians, are forced to leave Hawai’i to seek employment on the U.S. mainland. As they leave, they are being replaced by wealthy whites and white retirees, causing Hawai’i politics to drift in a more conservative direction. Government employment opportunities, one of the vehicles non-Native people of color have ridden to middle-class status in Hawai’i, are shrinking. And Native Hawaiians suffer the highest rates of socially rooted disease, suicide, and incarceration of all ethnic groups. Both the social and environmental costs and the costs of failing to define class interests in Hawai’i across the color line between settlers and indigenous people has been extremely high. And the cost is increasingly being paid by all but the most privileged working people in Hawai’i. Those courageous and visionary workers were blinkered by self-interest and failed to see that, for most Native Hawaiians, the rising tide that was carrying them out of peonage was just a flood. In the Deep South, as immigration drives demographic change, we would do best to remember that the color line can easily become a flood line if we’re not careful. In our efforts to improve our lives, if we fail to define our interests across race, we may find future generations trapped into choices we would never have wished upon them.